im Walker's homebred Zoomin For Spuds is the only past Champion of Champions winner in Sunday's Grade 1, $157,200 Brad McKinzie Los Alamitos Winter Championship at 400 yards. LOS ALAMITOS, CA—FEBRUARY 8, 2019—The road to the 2019 Champion of Champion begins on Sunday night when 10 older horses face off in the 19th running of the Grade 1, $157,200 Brad McKinzie Los Alamitos Winter Championship at 400 yards. The Winter Championship is the final of eight races to be held on Sunday with first post set for 5:30 p.m. The winner of the Winter Championship will earn a provisional berth to the Grade 1, $600,000 Champion of Champions to be held at Los Alamitos on Saturday, December 14. Past winners of the Winter Championship include BH Lisas Boy and Whosleavingwho, the only two-time winners of this race, Corona Kool and Nellie Delaney, the only mares to win the race, plus stars like Moonist, Good Reason SA, Jess You And I, Freaky and more. Five Champion of Champions winners have also won the Winter Championship, but only Good Reason SA won both races in the same year. The others - Whosleavingwho, Freaky, Jess You And I and Rylees Boy – added the Winter Championship to their Champion of Champions crown won the previous year. From the horses racing in the Brad McKinzie Winter Championship on Sunday, Jim Walker's homebred Zoomin For Spuds is the only past Champion of Champions winner. The Zoomin For Bux gelding won the 2016 running and will be looking to do one better than his runner-up effort to BH Lisas Boy in last year's Brad McKinzie Winter Championship. Jesus Rios Ayala will pilot the Monty Arrossa trainee from post number one. 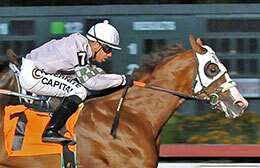 The 6-year-old gelding was outstanding when winning his trial by a half-length on January 20. Ed Allred's He Looks Hot is another top contender following his 1/2 length trial victory. The effort was his 10th career win which helped earn the Walk Thru Fire gelding the coveted AQHA Supreme Race Horse title, awarded to horses that win at least 10 races, two open Grade 1 races and at least $500,000. The Scott Willoughby-trainee is already a three-time open Grade 1 winner and is earnings are a field best $1,202,419. Vinnie Bednar will ride from post six. Zoomin For Spuds, who earned his AQHA Supreme Race Horse title last year, and He Looks Hot are both looking to earn a berth to the Champion of Champions for the fourth time. Only Refrigerator and Jess You And I (each with five) and Whosleavingwho and Heza Dasha Fire (each with four) have qualified to the Champion of Champions at least four times. There are four other horses in this race with past Champion of Champions experience led by A1A Racing LLC's Tarzanito, the 2018 AQHA champion aged stallion. To be ridden by Eddie Garcia for trainer Yanet Rodriguez, Tarzanito won the Grade 1 Go Man Go Handicap last year and enters this race after running second to Zoomin For Spuds in the trials. LD Is Back and Yanque also competed in last year's Champion of Champions, while Da One Two Special raced in the 2017 running of the Champion of Champions. He finished fifth in last year's Brad McKinzie final.